The members of the New Jersey Legislature are chosen from 40 electoral districts. Each district elects one Senator and two Assemblymen. 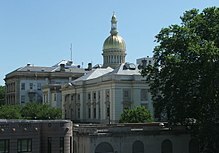 New Jersey is one of only seven states with nested state legislative districts, in which the lower house's districts are coextensive with a single state Senate seat. In New Jersey, each district elects one Senator and two Assembly members. (States which have similar practices are Arizona, Idaho, Maryland, North Dakota, South Dakota and Washington). 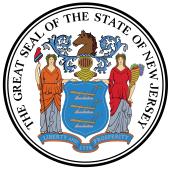 Districts are reapportioned decennially by the New Jersey Apportionment Commission following each United States Census, as provided by Article IV, Section III of the state Constitution. The legislative districts listed below went into effect with the swearing in of the 210th Legislature in 2002. They were used for regular elections from 2001 through 2009 (special elections through 2010), following the 2000 United States Census. The November 2011 elections were held for representatives of districts defined in the 2011 apportionment. Note: This district is not geographically contiguous, as Middletown Township is not geographically contiguous. The Sandy Hook peninsula is a part of Middletown Township, but is not contiguous with the remainder of the Township. However, as the entirety of the non-contiguous section of the district is occupied by the Gateway National Recreation Area (a national park), where there are no residents, this lack of contiguity is essentially inconsequential. ^ "New Jersey Legislative Districts Map 2001" (PDF). New Jersey Apportionment Commission. 2001. Retrieved October 22, 2015.